Hand Surgery Associates – What is Wrist Arthroscopy? Arthroscopy is a procedure performed by a surgeon to look inside of a joint. 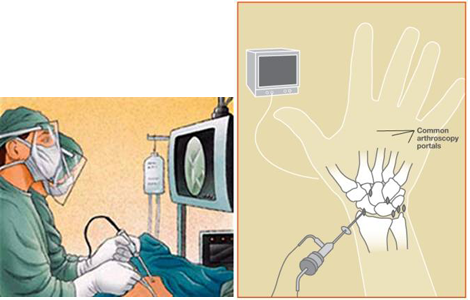 The wrist is a common joint to undergo arthroscopy, third only to the knee and shoulder. The surgeon makes a small incision and uses a tool approximately the size of a pencil which has a small camera attached to it.. The camera will project on a screen and allow the surgeon to see the various structures within the wrist. The surgeon may make other small incisions to see different structures of the wrist. The procedure will require general or regional anesthesia. 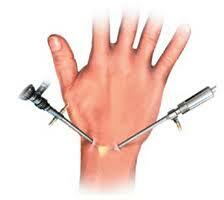 A wrist arthroscopy may be performed on the wrist if you are experiencing pain, a clicking noise or swelling. Although, there can be exceptions, the symptoms generally arise from an injury and usually mean there is an internal problem within the wrist. A wrist arthroscopy is generally performed if other measures and tests are inconclusive or if conservative treatments are not helpful. The overall recovery time is less due to smaller incisions, less swelling and a shorter immobilization period which leads to less overall stiffness and pain. Following surgery you may be immobilized for a brief period but will be allowed full use of your hand. You may also be given a referral for hand therapy to optimize your outcome.